Once I started learning classical guitar repertoire after nearly 40 years of folk style steel string, the classical position became necessary. I haven’t completely analyzed it, but the barre chords and left hand reaches are definitely much easier and less damaging to my body when I am holding the guitar in the classical position. It didn’t happen automatically, It was gradual. And now if I try to play, Lagrima for example, with the guitar in the old folk style position, it feels very awkward and “wrong”. Perhaps placing a micro-fibre cloth on the problem upper leg will help. I use one on my left leg because the guitar was slipping at that point, and it helps a LOT. There is a thread on this topic on the forum 'Guitar slipping off right leg - cheap solution'. Again I must reiterate that that is not my case. I am not STARTING CG. Nor coming from some other area like folk guitar. I've been playing CG for many many years. I've decided I will use a guitar support. I've ordered the Gitano. I hope that will do the trick; I'm fairly confident it will. With the Gitano you may still need some sort of non slip fabric to avoid slipping. I use a the Tenuto guitar support its similar to the Gitano and I still need to use a non slip drawer liner. Yes maybe, I'll see how it is when it arrives. I am using this solution for many years now but ON BOTH legs! Then, and only then my Guitar is very stable. And I also have adapted the classical sitting position right from the start when I got my first guitar lesson when I was about 15 years old (now 72). Yes there are lots of different solutions and combinations of solutions. It just takes time to work through them until you find the one that works. I wouldn't be bothered to change the way I hold the guitar at all except that it slightly restricts my right arm movement and I thought I'd see if I could adopt a 'better' position. I received a Gitano support yesterday so I'll see what that is like. I may still need to use something else with it. And I still need to experiment with different chair heights. Clearly the answer is in the fine tuning of various factors. Try searching for Pascual Roch’s guitar method Vol 1. It is available for free and I found it explains the sitting position quite well. actually I had a look and he just describes the typical traditional manner of holding the guitar. I don't see anything new or different there. but thanks all the same. here. This is the only way I've ever found comfortable. I think I'll stick with this. Take a look at a video or photo of Scott Tennant . American virtuoso and member of Los Angeles Guitar Quartet. If you comeclose to playing like him ...do not change a thing. Make the music. Eh? This isn't about playing 'like' someone; it's about how we hold the guitar. ??? I've just said I'm going to stick to the position above. As for Tennant, he seems to have chopped and changed over time. maybe looking for a better position as I was. In his book he recommends the traditional manner of holding the CG while in most videos on you tube he has changed to holding it on his right thigh. There is also a video of him using it with what looks like an ergoplay guitar support but on his left thigh, (search for "Scott Tennant performing on a Marchione Classical"). In other videos he uses no support and in some he uses different supports. I don't know if he still changes it around or if he's settles on one position. p.s. 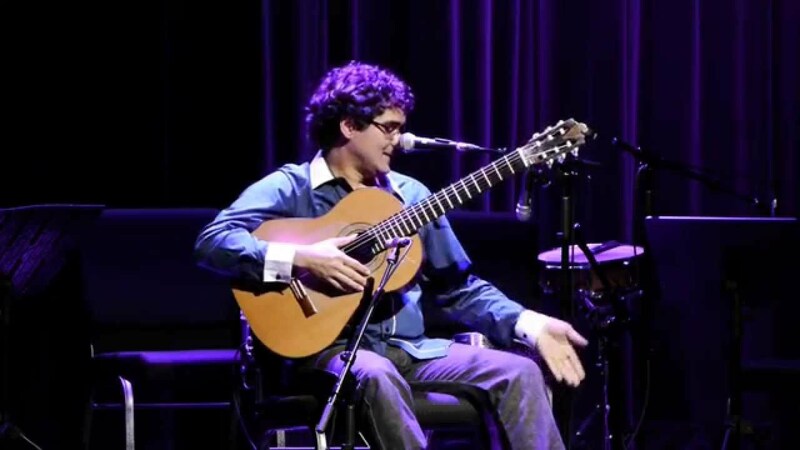 people like Alexandro Penezzi and Yamandu Costa are also virtuoso world class players. Check them out if you haven't listened to them. Look at the scott tennant interview http://www.classicalguitar.org/intervie ... t-tennant/, especially part 3. he explains he changed due to an injury. Last edited by philip caldwell on Mon Apr 30, 2018 3:52 am, edited 1 time in total. I've had the same problem. I alternate between using a cushion for the left leg and a piece of rubber or chamois on the right leg, and a couple of my own variations on the flamenco style, which both work pretty good. I prefer to have both feet flat, which makes it easier on my back and gives me better overall posture. I also use a strap for group playing with a shorter scale nylon guitar. I find its nice to change playing positions, keeps me limber. As a self taught classical guitarist the one 'big' thing I have never done is use the standard sitting position with a footstool and the guitar on the left thigh. However just lately I thought I ought to try and start using it. I could see advantages to it but I just cannot use that position ! I honestly don't know how any of you DO use it. In that position the guitar is very unstable . it wants to slide down the right leg or fall forward. My right arm has to hold it in place . I have the guitar at the correct angle with the headstock around eye level but the fingerboard feels miles away ( of course I would expect the position to feel a little strange at first). Anyway, If anyone has any useful advice on this I'd appreciate it. I was wondering about the ergoplay guitar support. Would they be any different? What do you think? Phillip, I have seen many classical guitarists use grip strips on their leg to prevent the guitar from slipping off. I was going to purchase the Oasis Grip Strip (from Strings By Mail) for a grand total of $9.95 for the very slippage problem you describe. However, I was having back problems and gave up on my foot stool. I purchased the Sagewood Barnett Guitar Support and absolutely love it (I purchased it from Strings by Mail). It is similar to the Ergoplay support, in terms of what it does,(i.e., an angled support) but I opted for the magnetic Sagewood Barnett Guitar Support to protect the veneer on my guitar. The suction cups of the Ergoplay can wear down the veneer of the guitar.